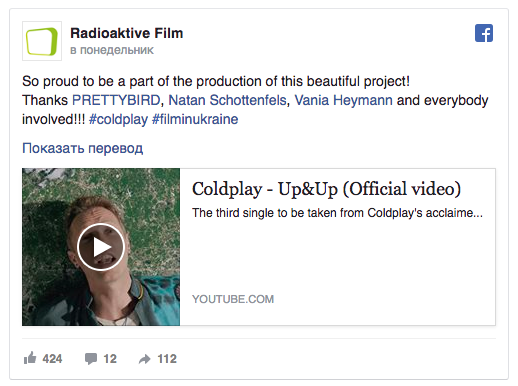 British music group Coldplay presented a new video for the song Up & Up together with the Ukrainian studio Radioaktive Film. Ukrainian company Radioaktive Film became part of the team working on the video, informs the official account of the company on Facebook. The four-minute video is very surreal. Rapidly changing frames show incredible things: playing football on a kitchen sponge from a volcano sees popcorn and turtles swim in the subway. Within less than a day, the video gained more than 3 million views. Now the video has more than 6.5 mln views. We also recommend you read: Who plays rock in the Kharkiv castle? and Kharkivens want Eurovision at Svobody Square.